In celebration of the Philippine Independence Day, our young winners of the National Music Competitions for Young Artists (NAMCYA)â embrace and reminisce our hard-fought freedom with music. Music has been a potent mode of expression since the colonial times in the assertion of Filipino nationalism. It is still today. This is the NAMCYA’s way of rekindling the ideas and emotions brought about by our fight for freedom. This is a partnership with the Bonifacio Arts Center through its festival, “BGC Loves Local,” in the newly opened concert venue, Globe Auditorium, at the Maybank Performing Arts Center. Join us in our musical celebration as our next generation artists enthral you with virtuosic renditions of well-loved Filipino classics. 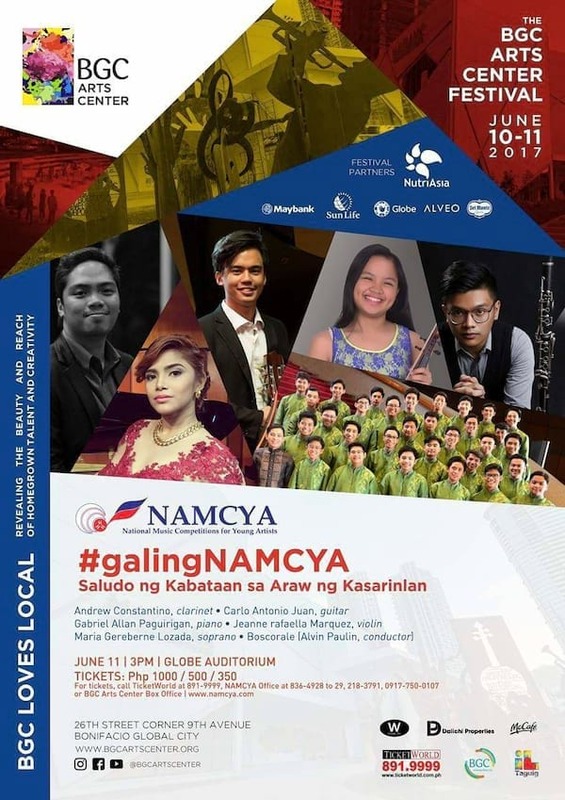 The concert, entitled #galingNAMCYA: Saludo ng Kabataan sa Araw ng Kasarinlan, features NAMCYA laureates Andrew Constantino (clarinet), Carlo Antonio Juan (guitar), Gabriel Allan Paguirigan (piano), Jeanne Rafaella Marquez (violin), Maria Gereberne Lozada (soprano), and Boscorale (Alvin Paulin, conductor). June 11, 2017 (Sunday), 3:00 pm, at the Globe Auditorium, Maybank Performing Arts Center, 26th Street corner 9th Avenue, BGC, Taguig City Metro Manila. Tickets are now available at all TicketWorld outlets +632-891-9999 or www.ticketworld.com.ph)â, BGC Arts Centerâ Box Office, and NAMCYA Office +632-836-4928 to 29.